"Rubber bullets" redirects here. For the song by 10cc, see Rubber Bullets. Rubber bullets (also called rubber baton rounds) are rubber or rubber-coated projectiles that can be fired from either standard firearms or dedicated riot guns. They are intended to be a non-lethal alternative to metal projectiles. Like other similar projectiles made from plastic, wax, and wood, rubber bullets may be used for short range practice and animal control, but are most commonly associated with use in riot control and to disperse protests. These types of projectiles are sometimes called baton rounds. Rubber projectiles have largely been replaced by other materials as rubber tends to bounce uncontrollably. Such "kinetic impact munitions" are meant to cause pain but not serious injury. They are expected to produce contusions, abrasions, and hematomas. However, they may cause bone fractures, injuries to internal organs, or death. In a study of injuries in 90 patients injured by rubber bullets, 2 died, 18 suffered permanent disabilities or deformities and 44 required hospital treatment after being fired upon with rubber bullets. Rubber bullets were invented by the British Ministry of Defence for use against people in Northern Ireland during The Troubles, and were first used there in 1970. The rubber riot control bullet is part of a long line of development of non-lethal control cartridges that dates back to the use of short sections of broom handle fired at demonstrators in Singapore in the 1880s. The Hong Kong police developed wooden baton rounds, but they were liable to splinter and cause wounds. 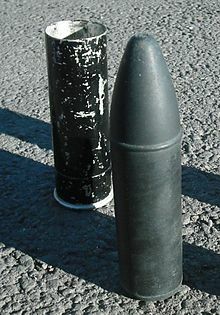 The British developed rubber rounds—the "Round, Anti-Riot, 1.5in Baton"—in 1970 for use against people in Northern Ireland. A low power propelling charge gave them a muzzle velocity of about 60 m/s (200 ft/s) and maximum range of about 100 m (110 yd). The intended use is to fire at the ground so that the round bounces up and hits the target on the legs, causing pain but not injury. From 1970 to 1975, about 55,000 rubber bullets were fired by the British Army in Northern Ireland. Often they were fired directly at people from close range, which resulted in three people being killed and many more badly injured. In 1975, they were replaced by plastic bullets. In Northern Ireland over 35 years (1970–2005), about 125,000 rubber and plastic bullets were fired—an average of ten per day—causing 17 deaths. The baton round was made available to British police forces outside Northern Ireland from 2001. In 2013 however, Ministry of Defence papers declassified from 1977 revealed it was aware rubber bullets were more dangerous than was publicly disclosed. The documents contained legal advice for the MoD to seek a settlement over a child who had been blinded in 1972, rather than go to court which would expose problems with the bullets and make it harder to fight future related cases. The papers stated that further tests would reveal serious problems with the bullets, including that they were tested "in a shorter time than was ideal", that they "could be lethal" and that they "could and did cause serious injuries". Israeli rubber bullets are produced in two main types. The older type, the standard rubber bullet, is a steel sphere coated in a thin layer of rubber, weighing 14 grams, while the newly improved rubber bullet, introduced in 1989, is a rubber-coated metal cylinder 1.7 cm in diameter, weighing 15.4 grams. Of the lethal injuries from this projectile, most are suffered to the head. Smaller rubber bullets are used in riot shotguns and are available in a variety of types. One company, for example, makes both rubber buckshot rounds, containing 15 8.3mm diameter rubber balls per cartridge, and rubber baton rounds, containing a single 4.75-gram projectile. In some countries, non-lethal guns that fire rubber projectiles may be used by civilians for self-defense. Kazakhstan – The civil population and private security guards are allowed to carry non-lethal gas pistols with the ability to fire rubber bullets. Romania – Rubber bullet guns are one of the few firearms that can be owned in the country by private individuals. Russia – Since 1999, the civil population, private security officers, and law control forces in Russia are permitted to use non-lethal weapons. A variety of handguns (OSA, "Makarych", HORHE, etc.) are carried with specially weakened construction and barrel with internal lugs, making use of full-power loads and/or firing hard projectiles impossible, while rubber bullets just compress when passing the lug and so may be fired. Most common calibers are 9 mm and 10 mm with muzzle velocity sometimes almost matching normal handguns and bullets as light as 0.7 g.
Rubber bullets, powered by only a primer, are usually used for short-range indoor target practice or training, generally with handguns. They are intended for only target shooting, unlike paintballs or airsoft pellets, which are intended for use on suitably protected live targets. 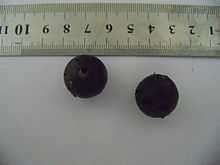 Rubber bullets, if used with a suitable backstop, can be recovered undamaged after firing, and reused many times. ^ a b Emily Yoffe (Oct 4, 2000). "What Are Rubber Bullets?". Slate. ^ a b WILLIAM D. CASEY. "Meister Bullets, Inc. Purchases 'X-Ring' Primer powered rubber bullet company". Officer.com. Archived from the original on 2010-04-29. ^ Anthony G Williams. "Less-lethal Ammunition". ^ Hogg, Ian V. (1985). The Illustrated Encyclopedia of Ammunition. London: The Apple Press. ISBN 1-85076-043-8. ^ Millar, R.; Rutherford, W. H.; Johnston, S.; Malhotra, V. J. (1975). "Injuries caused by rubber bullets: A report on 90 patients". British Journal of Surgery. 62 (6): 480–486. doi:10.1002/bjs.1800620613. PMID 1148650. Archived from the original on 2013-01-06. ^ a b c A Chronology of the Conflict - August 1970. Conflict Archive on the Internet (CAIN). ^ "Rubber bullets: Army kept real dangers in NI hidden". BBC. 11 June 2013. Retrieved 12 June 2013. ^ a b T. Lavy, S. Abu Asleh (2003). "Ocular rubber bullet injuries". Eye. Nature. 17 (7): 821–824. doi:10.1038/sj.eye.6700447. PMID 14528243. ^ "Fiocchi Munizioni 12 gauge riot control ammunition (Italy), RIOT CONTROL EQUIPMENT". Jane's Police and Homeland Security Equipment. Jane's Information Group. 2005. ^ "Перечень видов вооружения охранников... Сертифицированное в установленном порядке в качестве гражданского оружия... огнестрельное бесствольное оружие отечественного производства"
^ "3.1.3. Огнестрельное бесствольное оружие отечественного производства с патронами травматического, газового и светозвукового действия, соответствующими нормам Министерства здравоохранения и социального развития Российской Федерации"
Приказ Министерства внутренних дел РФ № 611 от 4 августа 2006 года "Об утверждении перечней специальных средств, видов, типов и моделей огнестрельного и газового оружия, патронов и боеприпасов к нему, норм обеспечения ими работников военизированных и сторожевых подразделений ФГУП "Охрана" МВД России"
^ "Суб'єкт охоронної діяльності має право: для забезпечення охоронної діяльності придбавати, зберігати та використовувати в установленому законодавством порядку спеціальні засоби, перелік яких визначається Кабінетом Міністрів України"
Закон України № 4616-VI від 22 березня 2012 р. "Про охоронну діяльність"
^ Постанова Кабiнета Мiнiстрiв України № 97 від 11 лютого 2013 р. "Про затвердження переліку спеціальних засобів, придбання, зберігання та використання яких здійснюється суб’єктами охоронної діяльності"
^ "X-ring rubber pistol bullets". This page is based on the Wikipedia article Rubber bullet; it is used under the Creative Commons Attribution-ShareAlike 3.0 Unported License (CC-BY-SA). You may redistribute it, verbatim or modified, providing that you comply with the terms of the CC-BY-SA.